Last week it was in the 60’s here, all week long (albeit raining). Then, on Thursday it got cold enough to get a little bit of snow. Enough for Andrew to have a little bit of fun in at least! And now, it’s REALLY cold. So, when I came across a recipe for this pork tenderloin I thought it looked great, something to transport me to a warm tropical beach – and away from the freezing tundras of coastal Maryland. Super duper easy too. I just threw together a marinade, let the pork do it’s thing – and then used the method that I’ve used for pork tenderloins in the past; seared it off on the stove first, then finished cooking in the oven. Since I didn’t want to let all that delicious flavor in the marinade go to waste, I went ahead and brought it to a boil on the stove then served it as a sauce alongside the sliced tenderloin. I love the flavor that the peanut butter and soy sauce lend, as well as the little kick of heat from the crushed red pepper. The original recipe called for mango chutney, which I didn’t have, so I just used some peach-hot pepper jelly that I’d gotten from TS Smith & Sons last year – and it turned out beautifully. But, orange marmalade or apricot preserves would be good too; just something that’s sweet, with a little bit of chunkiness to it. I served it with garlic rice pilaf (recipe coming tomorrow) and sauteed snow peas – and everyone cleaned their plates. If you’re looking for a change of pace, or to bring some exotic new flavors to the dinner table – definitely mark this one down on your menu soon! Combine preserves, garlic, coriander, soy sauce, rice wine vinegar, peanut butter, lime juice, orange juice, crushed red pepper and black pepper in a small bowl. Whisk well to combine, paying attention to break up the peanut butter. Place pork tenderloin in gallon sized Ziploc bag and pour the marinade on top. Squeeze out the air, and seal, using your hands to squish bag and distribute marinade evenly. Place in refrigerator and let marinade for at least 30 minutes, or up to 8 hours. Preheat oven to 425. Heat the vegetable oil in large oven-proof skillet (I like cast iron) over medium-high heat until shimmering. Add the pork tenderloin, and sear on all sides, until it’s nicely browned – about 7 minutes or so. Place the entire skillet into the preheated oven, and cook until a meat thermometer registers 160 degrees – about 15 minutes. Remove from oven and let sit for 10 minutes before slicing. While the pork is in the oven, pour the marinade into a small saucepan. If it seems too thick, add a splash or orange juice or water. Bring to a boil over medium-high heat, stirring constantly. Boil for 1 minute, then turn off heat. Pour sauce over the sliced tenderloin and sprinkle with chopped cilantro for garnish. Love the flavors in your marinade! Oh man, I can so relate. We were treated to warm January weather last week and suddenly it dropped 30 or 40 degrees out there and it is SO cold! I’m ready for spring 🙂 Love the flavors in this dish, definitely need to try it next time I pick up pork tenderloin. PS – I made your enchiladas for dinner last night and they were amazing!! This looks so delicious, Laura! Lovely recipe. I love jazzing up pork tenderloins and this is a great way to do it! This looked so delicious when you posted it on Instagram, glad to have the recipe now, I can’t wait to make it! Oh boy, that pork tenderloin looks and sounds delicious, especially the peanut butter. We eat a lot of pork tenderloin, so I will definitely be giving this a try. You have some amazing recipes and just love your photos! Nice recipe and photos. I’ve been on a complete soy sauce kick, putting it on or in anything that lends itself to the flavor. This is another great one to try! 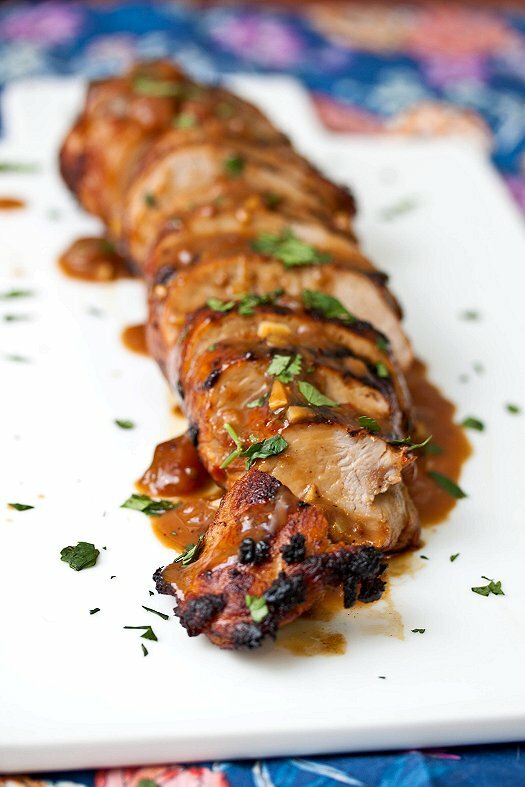 What a wonderful recipe using pork tenderloin, I’ve been wanting some for awhile….this is going to be the one I’m going to make – yours looks sooo gorgeous – makes my mouth water!!! Definitely worth a twist and try. I saw this on TasteSpotting and had to get the recipe! I love everything about this dish. I am going to make this for dinner tonight! Your recipes look amazing, Laura, and your photos are gorgeous! Pork tenderloin is one of those foods that I always forget how much we love. This recipe sounds so delicious, definitely adding it to my upcoming menu plan! Thanks so much for sharing this recipe. I made this over the weekend and it was absolutely delicious. I will definitely be making this again. Wondering if the OJ is just for thinning the sauce, or if it is intended for the marinade as well. TIA! I just used it to thin out the sauce, but if you wanted to add a splash to the marinade as well – I think it would be great! Thanks! I only had a little OJ left, and my 2-year-old drank it before I got the marinade completed! I did make this tonight with the garlic rice- we all loved it! Will be on my regular rotation. Thanks for a great dinner! Made this today, it turned out amazing! Love all the flavors and the sauce!…. To die for. Perfect with rice or rice noodles. Defintely a keeper! Thank you for posting this recipe. I will definitely be making this again! This sounds amazing! Have you ever done this in a crick pot? Laura, I haven’t – but I’d imagine it would be fine. Report back if you decide to give it a try! I tried this for the first time a few weeks ago and it has already become a family favorite! So simple to prepare and wonderful, complex flavors. Thanks for the great recipe! This looks sooo yum! I’ve never cooked with pork before and I love Asian food, so this was an easy choice. I tasted the marinade before putting the pork in, and not gonna lie, I could dip some potstickers in this marinade! This was fantastic! I didn’t have time to let my meat marinate very long, but it still had good flavor, and I served the rest of the sauce on the side. I have to make this again but marinate the meat overnight. I loved the combination of flavors. Made this for dinner tonight. OMG amazing! Had your garlic rice pilaf (with added asparagus, green onion, and cilantro to tie it together). Also amazing! The creaminess of the rice is risotto-esque. Can’t wait to peruse some more of your recipes. Thank you! I would also add that I made this with soy nut butter as my youngest is allergic to peanuts. It was a resounding success! I have the pork marinating right now, but I noticed that it doesn’t tell you when and where to use the 1/4 cup of orange juice, except when it mentions you have the option of adding a splash of oj if it’s too thick. I went ahead and just put the 1/4 cup of oj into the marinade, assuming that detail was perhaps accidentally omitted when you say, “Combine preserves, garlic, coriander, soy sauce, rice wine vinegar, peanut butter, lime juice, crushed red pepper and black pepper in a small bowl.” Fingers crossed. But. . . . with all of those ingredients, I don’t see how you could go wrong. I can’t wait to taste it! My mistake, thanks for pointing it out. It goes in the marinade! I’ve reposted your marinade recipe on my blog. Every loves this dish…I’ve made it several times already! Thanks so much! Thanks for the sweet comment, Margaret! So glad you enjoyed it as much as we do. Thanks for a fabulous recipe. I used substituted orange marmalade for the apricot and cooked it on the BBQ. Cooked the sauce for 5 mins. On the stove to kill any bacteria and it was excellent! If it’s not authentic then don’t call it Indonesian. Maybe I should bake some fish and put peanut butter on it and call it American style baked fish? First of all, Indonesians don’t eat pork. If you check the demography, the majority of Indonesians are muslims, which means they don’t eat pork. Second of all, I am Indonesian and I have never seen this dish in my whole life. Peanut butter and soya and they call it Indonesian? Oh well. Talking about authenticity. Kutubuku, please see my previous comment. I gotta tell ya, I’ve made this many times at my firehouse in New Orleans, and it is a crowd pleaser! Aghh! I’m attempting to make this right now it looks so good! Plus, I was looking at previous comments. I’ve no idea whether or not this dish is pure Indonesian or whatever, but using Peanut Butter in a dish is tooootally a huge Dutch thing to do (I know this coz my partner’s Dutch) and there’s SO much Indonesian cooking/kitchen qualities in the Netherlands because of the political ties and relationship Indonesia and Netherlands have had in history. So to me, this recipe being called Indonesian isn’t so random. People need to caaaaaalm down. Thanks for having my back, Craig! Hope you enjoy it as much as we do. This was delicious on chicken as well! Thanks for sharing the recipe. My parents lived in Indonesia my first two years of college, and I visited a few times, and always loved the food. Although I never had anything exactly like this there, this is definitely in the neighborhood of an authentic Indonesian dish with the wonderful mix of flavors. I will definitely make this for my parents next time I see them. Thanks again! Anyways I saw this recipe and am going to give it a try for tonight’s meal…as it looks amazing. This looks great, did you use ABC Ketjap or regular soya sauce? made this for dinner tonight. It was awesome. Hubby said it was the best pork tenderloin I ever made…& we’re married for 43 years! Only Ichanges made were I lessened the peanut butter because I didn’t want hubby to taste it (hates the stuff) & used lemon instead of lime because that’s what I had Iin refrig.. Thanks for sharing. Will be making this again and again. This is one of my favorite pork tenderloin recipes. I could drink the sauce with a straw! I have made it as written, and subbed half the PB for peanut wonder to cut the fat and it works both ways. Thanks for a great recipe!